An artist's depiction of the tiny twin MarCO spacecraft on their way to Mars. Two tiny explorers are pushing the bounds of their kind, but if scientists have their way, the two adventurers will soon have plenty of company. 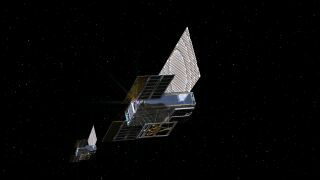 The pair of small satellites, called the Mars Cube Ones (MarCO-A and MarCO-B), launched in May along with the Mars InSight lander. All three spacecraft are on their way to the Red Planet, which they will reach in late November. On Nov. 26, InSight will carefully negotiate the challenges of landing on Mars, and the MarCOs will be there to watch, recording the landing for engineers back home to learn more about the always-challenging process. The tiny mechanical assistants will also act as a redundant communication relay system in order to see whether NASA could rely solely on small satellites for that job in the future. But in the long term, scientists have much bigger dreams for this class of small satellites, which are about the size of a loaf of bread and which sport similarly small price tags for spacecraft. "Our hope is that MarCO could help democratize deep space," Jakob Van Zyl, director of the Solar System Exploration Directorate at NASA's Jet Propulsion Laboratory (JPL), said in a press release. "The technology is cheap enough that you could envision countries entering space that weren't players in the past. Even universities could do this." NASA has enthusiastically backed small satellites in general and has sought commercial proposals for their use. And the team behind the MarCOs hopes that their work will offer shortcuts to future engineers looking to take small satellites beyond Earth's orbit. "Almost all the features of MarCO are being adapted for use on future spacecraft," John Baker, the program manager responsible for small spacecraft at JPL, said in the release. And that is, in essence, what the MarCO satellites were designed to do: The pair is a proof of concept and an opening shot — now it's anyone's guess what could come next. Editor's note: This story has been updated to clarify the path of the MarCO signals.